This is not the conclusion post to this series(though I wish it were) because we aren't out of debt. When we reach that amazing freedom- I will share it with you. But until then, I will offer a mini conclusion outlining some of the things we have been doing to save money and some of the resources we've used to get discounts and free items! 1-Coupons- I know this word makes some people cringe- I used to be the same way. Admittedly, there are some people who are ALL about the couponing and know all the ins and outs of it. I don't. Basically, my dad saves the coupon inserts that come out in the Sunday Paper that he used to just trash and I sit down during my lunch break and "shop" through the coupons. And also we pass them around at work! The coupons aren't like days of old where you bought 5 of the item so you could get 1 free, most coupons offer a savings of $.25 to $1 for purchasing one of the item. Sure there are the save $0.50 when you buy 3- but if I don't need three of them then I don't clip it because I don't clip just to clip even if they are good deals. If they aren't things we will actually use, then I skip them. I store my coupons in a cute organizer that my husband bought me at Food Lion. And while I am filing them I go ahead and remove expired ones or move ones that are about to expire to the front- if we need them. I do not buy stuff just because I have a coupon unless we are in need of it soon. As I mentioned before- we don't have space enough to store a lot of bulk. I know $0.25 or $0.50 doesn't sound like much, but I have saved over $30 on a single grocery trip after all the coupons were scanned! 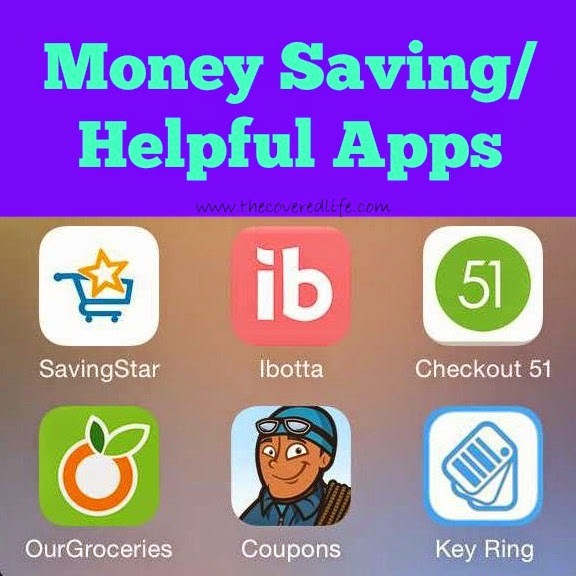 2-Moneysaving Apps Ibotta, SavingStar and Checkout 51 are similar to clipping coupons, except it is all kept in your app on your phone. And if your store has a loyalty card like VIC or MVP, you can link your card to the SavingStar and Ibotta apps so when you purchase the items you have selected in the app, and scan your card at checkout, you get the savings! But keep in mind that the savings aren't reflected at the time of purchase, they are "banked" in the app. When you get $5 in Saving Star you can cash it in for a $5 Amazon gift card code or another option and in Ibotta when you get $10 you can cash it in for a $10 iTunes gift card code (you can also do Starbucks, Regal Movies, and PayPal). And if you are shopping at a store without a discount card, you can submit a picture of your receipt, like you do with Checkout 51. Ibotta and SavingStar also have other ways, you can "shop" and save not just for grocery items but with online shopping and other stores and items. What I love about this is that we love Amazon and iTunes, and now we can shop there for free! A:Our Groceries- Basically, it's a grocery list- I know paper and pens do still exist. But for me- I (pretty much) always have my phone. Pen and paper- I lose or forget at home. But with this app, I can just open it on my phone and type in items as I think of them that we need. 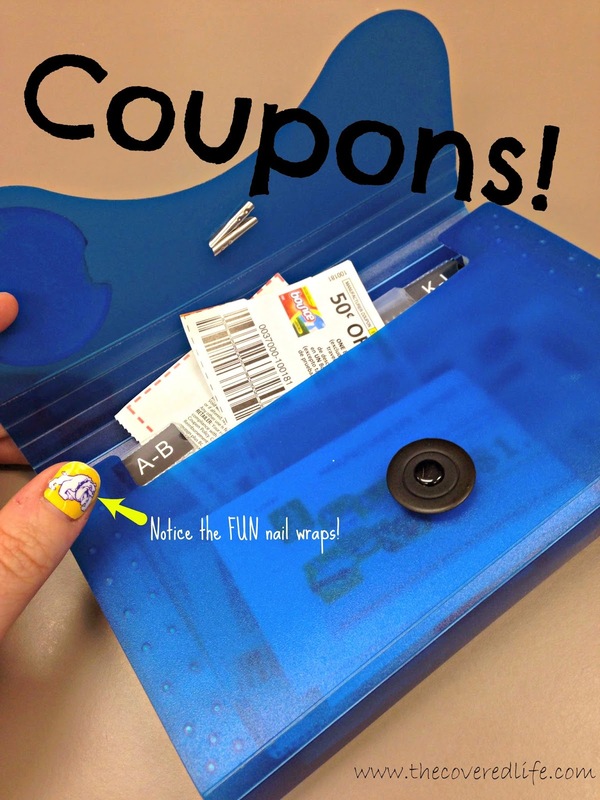 Then I check my coupon stash and take out the coupons of items I'm buying either putting them in my wallet or holding them in my hand, so I make sure I get the right thing. And as you tap the item in the app it gets crossed off. Another great feature is that my husband has it on his phone, and they are synced so if he adds or deletes something it shows up on mine. Occasionally, we have gone shopping together, so this has worked well in our divide and conquer- get it and get gone approach to shopping! The best benefit to this, is that it decreases my splurge purchases- that cost extra money. And if you pair this app with the money saving apps above and the meal planning described below- it really is so useful! B: Key Ring app is a place to store all of your cards you keep on your key rings. For example, CVS, Food Lion, Walgreens, Harris Teeter, Rite Aid, Sheetz, Hallmark... they can seriously bog down a key ring, but if you keep them in this app (take a picture of the front and back of the card) they can be scanned from here in the store. Another great feature of this app, is it shows sale "papers" from stores in the area, and also special offers from businesses- from oil changes to savings at shoe stores or restaurants! This is great if you are looking for an item and want to quickly see if a store has it on sale! C- The Coupon Sherpa app- I don't make a purchase without consulting! There are MANY stores listed within for online and in store coupons and/or specials that are current. 4- Meal planning- This is something I don't do enough, but when I actually do it, I really do save money. It does take time and with a one year old and full time job, plus life, sometimes it just doesn't happen. But the reason this is on the list is because during the meal planning phase, I discovered some quick meals that I can make with just a few ingredients. Like tortillas for a Mexican pie or for a Parmesan chicken wrap that I discovered on Comfy in the Kitchen, Mix and Match Mama and/or Pinterest. And the sauce used in the wrap can be used for spaghetti. And I get the chicken strips to use in the wraps so we can use them for just a chicken strip dinner with a side of rice or something. And there you go four meals with same main ingredients that you can use the leftovers for, instead of them being thrown out- which I think is the benefit to meal planning. And with meal planning, I use my Our Groceries app to list all the ingredients so I can make sure I don't forget something! 5-Pinterest- Is any list complete any more without Pinterest?! 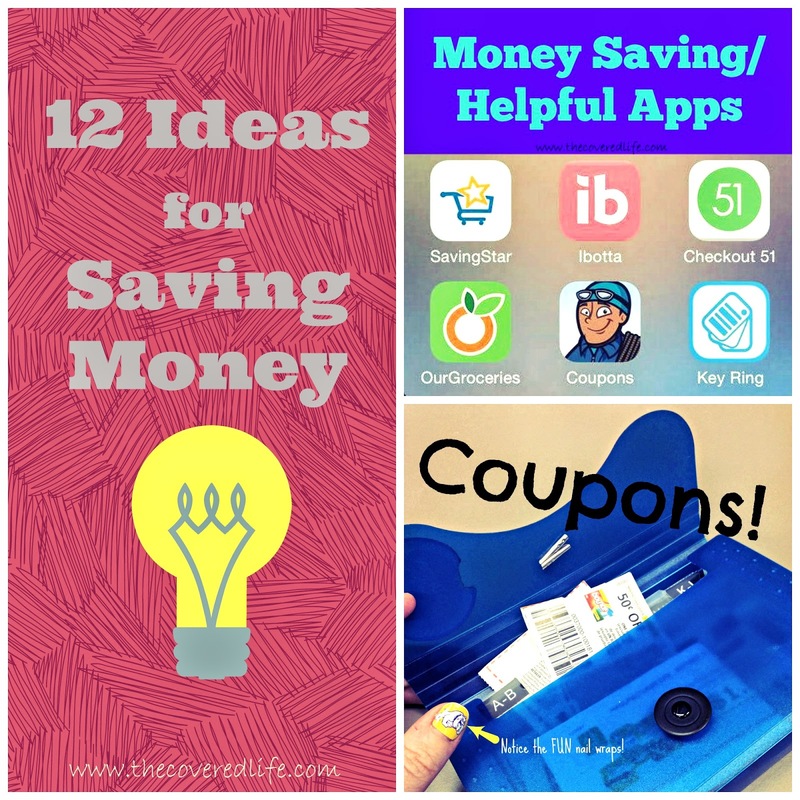 In addition to the recipes that I find from Pinterest, there are also many tips for saving money, that link you up to money saving blogs - two of my favorites are Money Saving Mom and Passionate Penny Pincher! These websites exist with the sole purpose of saving money! I also follow their pages on Facebook, so that in my daily perusal of Facebook, I can see the great deals, discounts and strategies they share each day as they post them! And Pinterest also provides organization hints and tips for re-purposing items and do-it-yourself things which can save quite a bit of money in the long run. 6- Collecting Change- This sounds like a no-brainer, but my husband and I have jars in our bedroom where we put our loose change. I thought we would have to roll it and all that jazz but gone are the days of counting and stacking pennies and then rolling them and taking them to the bank- it's so easy now! We took the jar to a Coinstar machine at the grocery store and simply poured the change into it and it sorted and counted it for us. And you can get cash back with a small fee, or you can get a gift card to numerous places including restaurants (we chose Amazon, of course) and there is no fee. 7- Online Surveys: I tried other survey websites, but decided to stick predominately with Pinecone Research- This and other sites reward you for taking surveys. Pinecone Research is a market research company that sends surveys about new products. You can choose to cash out or save up points- I am saving up for some Duke car mats! They send one to two surveys a month (so it's not a big earning venture) but it also doesn't take a lot of time. They have a wide assortment of items- movies, gift cards, and many other rewards in their catalog. They only have enrollment a few times a year and should I get an email about that, I'll be sure to post the link here. Another program similar to this is Swagbucks, though it isn't just a survey company, they reward you for watching videos and searching through their search engine. Many people have had success with Swagbucks, I just don't have the time. 8-Rewards Programs- Huggies, MyCokeRewards, Kellogg's Family Rewards and many more companies have codes that are placed on their products. It takes a few seconds to type in the code in the website and then you begin to bank up the rewards points towards free gift cards/products. And some programs are available through texting- so in 5 seconds you can send a text with the code without having to log into the computer. Admittedly, I'm not as diligent about this as I should be, but I just mention the opportunity because if you are a Coke-aholic like someone I know, then you could bank up some serious rewards very quickly! And a lot of people use rewards from programs like these and Swagbucks to buy Christmas gifts. Think of the amount of money you spend on Christmas each year- then think of the amount you could save by giving gifts or gift cards that you got for free! 9- Launch Teams- Launch teams are a group of people who are chosen to help promote a product. You do have to apply for this opportunity, but so far I have been part of 3 launch teams- 2 for books and 1 for a CD. I have been sent a free copy of the books and CD just for my willingness to promote it on my blog and/or social media (Twitter, Facebook, Pinterest). I will be sharing more about the CD "Only Jesus" on the blog later, but I am so excited about it- and not because it was free! 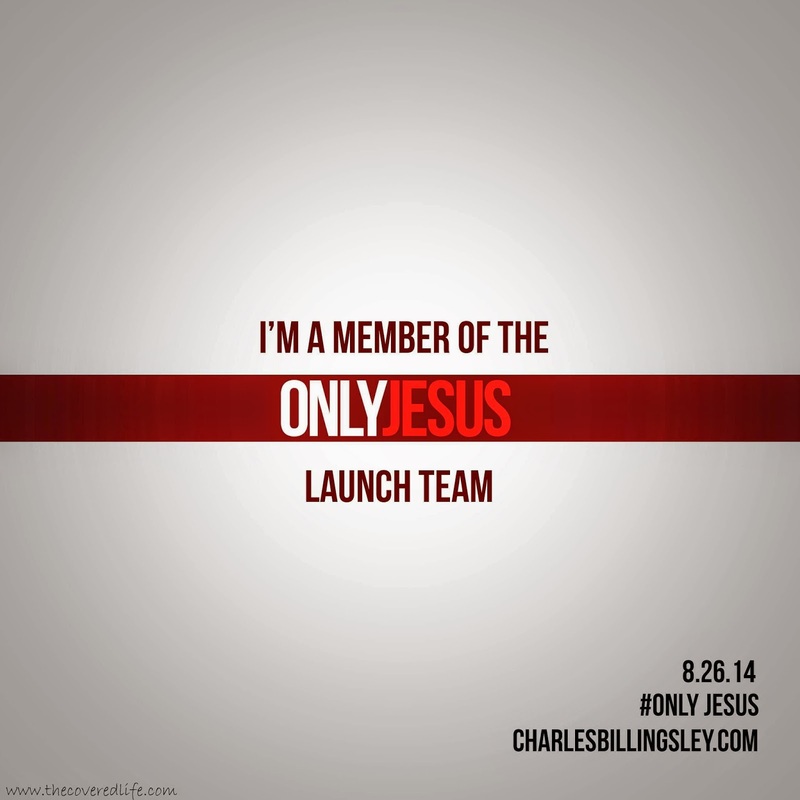 I am excited about being on the launch team because I get it for free, but I would have bought it anyway! 10-Email Subscriptions- Just being willing to sign up for company's promotional emails has helped me earn a lot of percentage discounts, be notified of upcoming sales and even receive offers for free or discounted products(Carter's, Lifeway, Shutterfly, etc send 20% off and 30% off emails frequently). For example from MyCokeRewards, Kellogg's Rewards, Burlington Coat Factory and Huggies I have received email offers for a free 8x8 photo book from Shutterfly. Obviously you have to pay shipping, but I was able to make a yearbook of Bug's first year for less than $10 total- and it was only that much because I added extra pages! And because I had additional book orders, I made a book for each set of grandparents! I get it, you don't want your email filled with promotions-- well that's why I created a free gmail account strictly for those type of emails. Any time I go into stores that ask for my email, or sign up for free products, or giveaways I use that email. And because I know that that is the only email I get there, I can quickly go on my Gmail app every day and delete the ones that don't interest me and keep the ones that do! 11- Write Reviews- I have received 2 free audio books just for my willingness to share an honest review of it. I love reading reviews before I purchase items, and was doing just that on Amazon, when I saw the statement, "I received a free copy of this book for my truthful and unbiased review from christianaudio.com." I thought this sounded like a great idea! Already, I was "purchasing" books for my Kindle whenever they were on the free list. So I applied to be a reviewer with christianaudio.com- and I was accepted! The beauty about this is I get to listen to these books on my way to and from work (45-50 min drive each way) and I am listening to Christian authors. Win! 12- Read Blogs- The majority of the items on this list I discovered on various blogs here and there. Blogs are a great way to find out things. There are blogs devoted to recipes and saving money, and there are also blogs that are about people's lives and adventures. And yes there are a LOT of blogs. 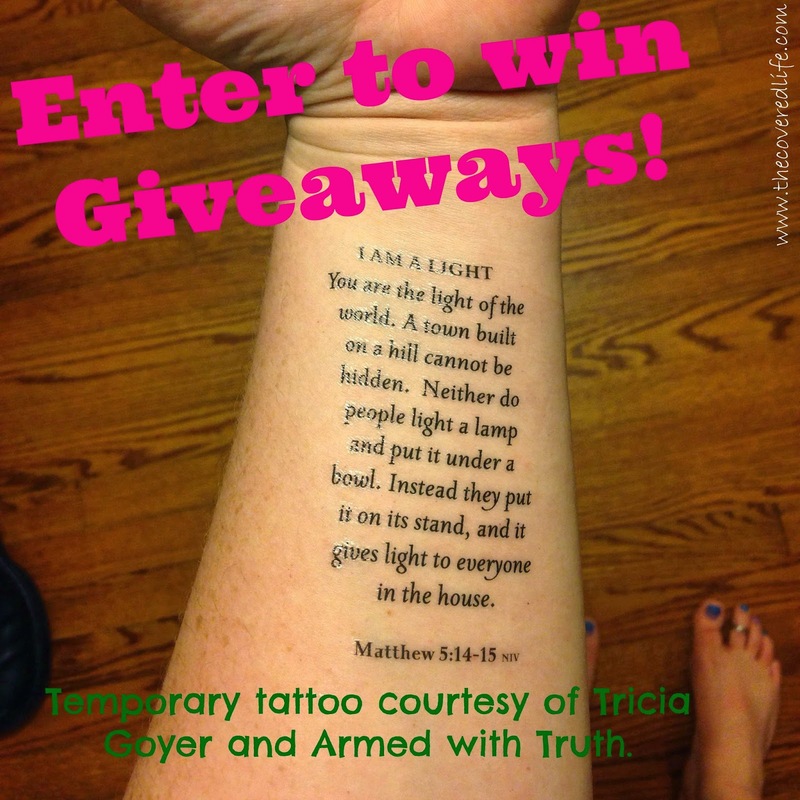 But many partner together to do guest blog posts or host giveaways (I have won a book and a set of scripture tattoos just by entering a giveaway). It was through blogs that I found out about two of the launch team opportunities. And all the apps I mentioned above were discovered by recommendations on blogs. People can be a great source of information! This is the main reason I wanted to write this post. I know that I am not an expert by any stretch of the imagination at saving money, but what I do know is that one or two of these ideas may be something you didn't even know was out there and may contribute to your saving money efforts or your inclination for getting free stuff! So there you go, these are the things we have been doing to save money here and there and also get items for free. I know there are so many more options and I'd love to hear them so please share them in the comments below. You can read the other parts of this story here: Part 1- New opportunity and Part 2- Why We Care About Debt.